The bio on Michael Chabon’s website is one of the most punk rock author bios I've ever seen. Clearly, the task of writing it was not left to chance or some publicist. Where other authors might limit themselves to the strictly professional, Chabon spices things up with details on his bar mitzvah, his failed first marriage, and the births of his children. Where others’ timelines grow weighty with evidence of increasing fame, his reads more like a diary, written in the third person. Given his zest for personal milestones, it’s surprising he didn’t see fit to share that he was once the lead singer in a Pittsburgh punk band. It would have fit nicely between the photo in which he and novelist Jon Armstrong are garbed as strolling Renaissance Festival players and the moment he enters an Oakland crawlspace to begin work on The Mysteries of Pittsburgh. 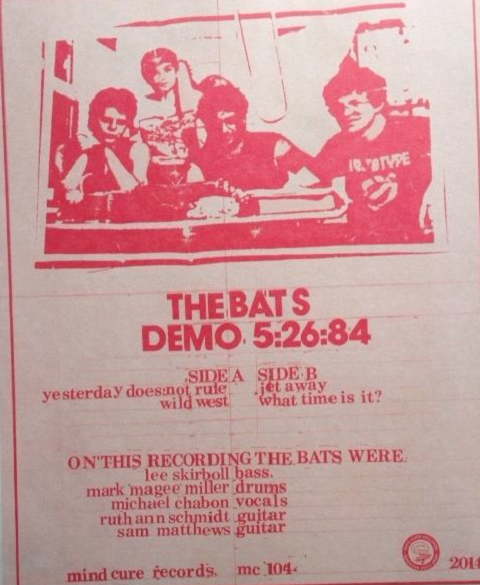 He might rethink this omission, now that Mindcure Records has released the four-track demo that is his band, the Bats’ only studio recording. Also preserved on vinyl is the author's sole live outing with the band, a 21st birthday gig at the Electric Banana, shortly before he graduated from the University of Pittsburgh and disappeared into that crawlspace. The label describes his vocals as “snotty.” It’s a compliment in context. Thanks to Mindcure Records, Open Culture readers can sample the self-effacing Pulitzer Prize winner’s vintage vocal stylings, above. In the clip away, we have him singing "Jet Away." Chabon may think he sounds “awful,” but I don't hear any cause for shame. You can pick up your own copy of The Bats' album, ‘Demo 5:26:84,′ with Chabon on vocals, here. Worldarts.com.pk goal is to deliver the best, where no other plat-form can offer, We are unique in our services, because of our dedicated team work and the services we provide.